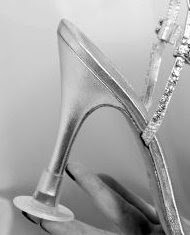 Relentless Bride® Weddings, Wedding Planning, Life & Marriage: A fancy Sole Mate? I stopped by The Wedding Corner this AM and saw this great product, so i had to share!!! In addition to the Solemates I reviewed way back in the day, I was enlightened by a similar product that's a tiny bit fancier for a party, celebration OR wedding and that protects your shoe's heels and keeps them from digging into the grass, dirt, etc! It reminds me of a small outdoors umbrella stand that was covered in glitter. haha, those make me laugh! :) I think I may try these out though (not the fancy ones). This past weekend we went to a park and i kept on getting stuck in the grass! I've been in situations before where I definitely could've used a pair of those!